The ASP.NET Core Rich Text Editor control is a feature-rich, WYSIWYG HTML and markdown editor that provides the best user interface for editing content. The ASP.NET Core Rich Text Editor is a lightweight WYSIWYG HTML editor and WYSIWYG style Markdown editor that provides the best user interface for creating and editing content. It returns valid HTML markup or markdown (MD) format content. The Rich Text Editor provides a wide range of tools from the toolbar and quick toolbar to make the best WYSIWYG editor. The ASP.NET Core Rich Text Editor control can be used as a WYSIWYG HTML editor. It allows users to view and edit content as HTML markup and to view the HTML source using the Code View icon. The Rich Text Editor control can be used as a Markdown Editor. It allows the content to be in the markdown format. The typed markdown syntax content can be previewed using a third-party plugin. 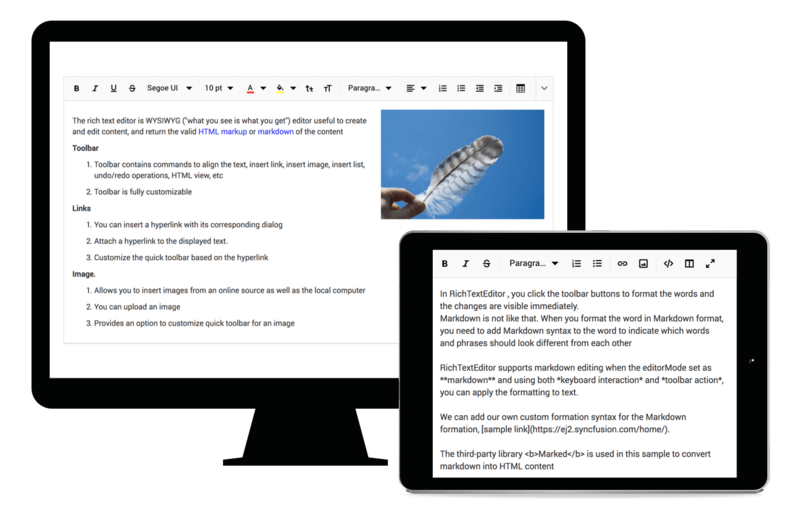 The markdown editor allows users to view live changes of the markdown format editing content (md file) in an HTML preview in the live markdown text editor. The ASP.NET Core Rich Text Editor supports Iframe editing with customized Iframe attributes. It also easily changes the appearance of Iframe editor’s content when using external CSS and script files. Makes the inline HTML editor to show up when you click or select the content in an editable area. Easy to integrate third-party libraries like spell checker, code mirror, etc., with the RTE to improve the content in ASP.NET MVC HTML text editor. The ASP.NET Core Rich Text Editor recognizes touch gestures, allowing the user to swipe left or right to move the toolbar. The responsive, mobile friendly design provides the best user experience on all mobiles, tablets, and desktop form factors.